The answer is yes. We are all Ram fans and bleed blue and gold. That is how we are connected to the Rams. As far as the organization goes. No. There are some who believe the players do frequent here and may even post a time or 2. We have also had Holt do a nice little question and answer. The offer has been put on the table for us to run there "offical" site fan area, but they don't seem interested. There loss. Thats dissapointing. Of course we bleed blue and gold. I know we all LOVE the Rams. But for the organization not to take notice of its biggest fan base is disheartening. Perhaps someone... many of us should write letters to the organization. The reason I started this thread is becuase of the Hasselback comment about the Dome being quiet when the cards are in town. I don't see how pushing, the Rams BIGGEST fans, us, aside and not acknowledging us helps that situation any. I don't know how I always end up cheering for pro teams with the CRAPPIEST management. Leafs/Rams... the list don't stop. This should be the official message board of the St.Louis Rams. Stlouisrams.com closed theirs down a while back. They probably shut down the official board because they knew I was going to win Rams IQ the following season. If this became the official board of the Rams every dipstick on the planet would be on here cluttering it up with stupidity and countless moronic posts. I personally don't want to see that happen. That's where the mod staff comes in. Just my personal opinion, but I don't see the organization turning over any amount of authority to outside sources (Dez and the mods) of an entity (ClanRam) bearing the franchise name (Rams). The Rams want "their" official board run "their" way.....which as it turns out, is a lot less structured (pert near anarchical, if you ask me) than ours. This is the unofficial, official RAM fan board. Not as long as I am here they won't clutter this board with non-sense. Well at least we're all in agreement, that we should have some recognition from the Rams org. Not that I don't trust the mods, but I'm sure many of you have see a yahoo or espn or any other big, open to the public Rams board, there is pointless drivel being posted almost every minute. Post after post of meaningless nothing. Do you mods really want to deal with that? Want to? No, of course not. Would we do it if we had to? In a heartbeat. I'm not so sure. Yes, it would be "cool" to be on the "official" site, but we've done a pretty good job as an independent web site. Look at some of the posts from visitors, like our opponent's fans during the season. The ones who visit us to talk about an upcoming game usually begin with something like "Wow, you guys have a really nice site here." I don't need an "official" stamp to know that we have one of the best football sites around - heck, it's one of the nicest sites, PERIOD! Part of the anarchy at the so-called 'official' sites is due to lack of moderation, and some because of troublemakers trying to 'push the limit'. Dez has set some FIRM rules, and allows no leniency, therefore, there is very little trouble here. We also have nfl related legal issues on conflict of interest. Dez owns part of the rams, he cant also own the official website. Do You Promote ClanRam To Other Rams Fans? 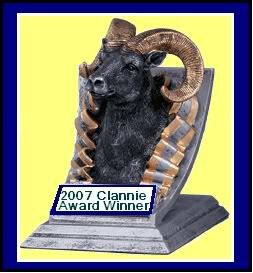 Do you promote ClanRam to other Rams fans? If so, how do you do it? I have lost touch with many of the people that I posted with on the official site's board until the abruptly took away the message board. 1. What will RamFan16 do when he turns 17? 2. Is bigredman a fan of cinnamon chewing gum? 3. Why is CanadaRam! yelling? 4. Does Bruce=GOAT realize that the abbreviation for "Greatest of All Time" reads like the horned farm animal? 5. Is Goldenfleece's real name Jason? 6. Exactly how old IS OldRamsFan? 7. Is coy bacon the same person as Claude Crabb on the PD board, or is there more than one person who likes obscure Rams of the 70s? 8. If majorram were to meet general counsel, would he be obligated to salute? What would you like to see here at the Clan to make the best Rams fan site on the web even better? More polls? Fewer polls? More contests? More sub-forums? Different sub-forums? More interaction with fans of other teams? In responding, feel free to be critical (just be polite). I can't promise that we'll make all the changes you suggest, but its helpful to know what the members are thinking. What if ClanRam doesn't really exist? Have you ever considered the possibility that, right now, you are not actually reading an internet message board but, in fact, are staring at a blank screen and "conversing" with dozens of your alternate personalities? If that's the case, that would mean that some aspect of you is a quirky Scotsman, a periodically grumpy Texan, a wise a$$ lawyer, and various other characters of different ages, genders and backgrounds. Man... you really are sick! And what about this post? Is this the small sane part of your psyche trying to break through and prompt you to get help?